This is the first time I've ever written an entry that's more life-update than anything else – gone are the days when all I'm posting here is Supernatural fic, apparently – but, I have a lot to share and this journal clearly is a great way to do that. First off, I recently had the good fortune of bidding on and winning the amazing writing talents of the awesome ultraviolet9a during the Sweet Charity auctions and am thrilled to pass on that the fic has taken shape and should be beta-ready very soon. This news is just terrific, especially getting it today. I can't wait to read it and of course, share it with y'all :). Secondly on the SPN fic front, I am utterly gob-smacked to report that my own muse has reawakened from her 350 day long coma and *I* will have fic to load here in the very near future (once the fantabulous pdragon76 has her beta way with me)! I can't tell you how relieved I am that I was able to write the Winchesters again. I missed it so much but, alas, I am truly one of those fic writers who are completely at the mercy of her fickle muse. Watch out for Heavenly Fathers soon and do let me know how the voices and characterizations hold up… I did feel a little rusty. Okay, so there's only one but a few weeks ago my big sister and her hubby rescued and are now fostering a female kitten that was living wild. Sadly, her littermate(s) have still not been caught/rescued by the many out there trying to help them. My sis already has 2 cats (one of which was a feral they rescued 3 years ago) plus an old dog in his declining years and with plans to move back to the city and downsize in the next few of years, they really don't have the room for this kitten. Now, it wouldn't surprise me at all if they ultimately end up keeping her because there's no way they'll give her up to a shelter, but if any of my flisties have friends in Ontario (Toronto-ish) that might be considering adding a kitten to their lives, here are a couple of pics of Little Lora (named for the Lora Bay area where she was found). For those who haven't read about his saga, here's the link to it, my most recent post to this journal. I had a long talk with his owner and have since heard from her via email and it looks like he truly will only be staying with us temporarily once he gets dropped off here, likely the evening of the 10th. Dakota's mom is adamant she will never give him up – loves him too much. I only wish that made me feel better, but it doesn't. For my gang's sake, having him here only about a month is a much more palatable disruption. For Dakota though, I feel like I should sit down with his owner and try to convince her to give him up permanently whenever she comes to get him back in December. I just don't have faith that his home-life/situation is going to do anything but get worse and, before he becomes a total head-case, I want him back here ::sigh:: Anyway, once he's been under my roof long enough for me to assess him, I'll send another update. Wish us all luck. They should've arrived in ND earlier today though I haven't heard from them yet. Will I? Probably not. Given today's date and last year's precedent, I won't hear from him until tomorrow ;). And lastly, as some of you already know, today's my birthday and it's been a fabulous one. 44 rocks, people! Okay, so undoubtedly hubby's going to forget to call (he's been on the road since the morning of the 29th so has probably lost track of dates) but, with all of my lj-friends keeping me company, it really has been one of the best birthdays I've ever had *g*. I have to rec pdragon76 's birthday surprise for me. It totally caught me off guard when she sent me the link in the wee hours of this morning and I've been grinning from ear-to-ear ever since reading it. For any of you who know me well enough to frequent this journal, you'll see just how wonderfully and perfectly fitting this hysterical mini-picspam/mini-fic is for me. Read it here and enjoy! Thanks everyone. Have a terrific day and, I know I'm a Canuck so don't have a say, but many of you guys do... don't forget to *VOTE* this week! ETA - Guys, so sorry, I went in to add a few new names and ended up losing at least 5. LJ and I just do not get along. I thank all of you I've so carelessly deleted. Thanks so much again for making this a memorably fun day :). That's great that you're writing again! I can't wait to read it. Thanks, girl. I actually had to step outside and check the mailbox... couldn't recall if I'd checked it Friday. nothing there though and we still don't have weekend delivery. Likely early next week. You just never know, as we've seen in the past. I've been off work since Thursday and am off all week with the dogs while Wayne's away. He's only traveling with Cooper this year so I have 6 at home, unlike last year when he took 2 of the terrier along with Cooper. Since he's traveling with Adam in my van and Adam has 2 pointers along, no room for terriers. I'm doing okay with these guys though. I can generally split the 6 up in 3 pairs and give them all pseudo freedom in the house. And yes, I'm thrilled I actually wrote something though it felt agonizingly slow! The story's about the size of All Told and, truthfully, I'm a little disappointed in how much it feels kinda like a combo of All Told and the present-day stuff in my last fic (not as original I guess as I'd hoped?). *But*, I'm happy with the words and it's in Dean's POV for the first time and that feels good, so hopefully that means I'll be able to write from his POV again in the future. I'm just so damn relieved my muse came to life, even if only to re-hash some themes I've already written about ;) It's a tag to 4.07 so Castiel's in it so I'm anxious to see how people think I did with him. Though I think since 4.01 the different SPN RL writers have played with his "voice" a fair bit so I think my Castiel sounds more like 4.01 Castiel than the one I've watched lately. We'll see. And happy Birthday-again! ;) I am so glad your day has been awesome! 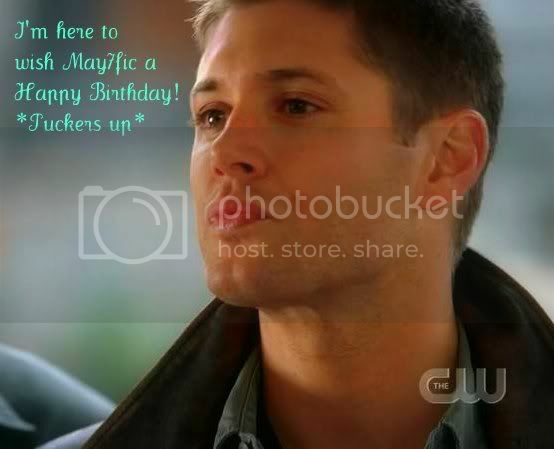 It sounds like you've had alot of b-day wishes and presents on LJ! Yay! You deserve that and much more-you rock! I hear the door knocking.... ooohhh look!!! LOL, I'm puckering back, baby! Go for it-it is your birthday! I just couldn't resist! I know, isn't she a doll? Oh, hooray for muses! I so know that feeling, and YAY, it came back to life! Whooot! I look forward to seeing your tale hit the intarwebs. Oh, hooray for muses! I so know that feeling, and YAY, it came back to life! Whooot! Once Dakota spends some time with us, I'll get a better feel for where he would do best. Another home, if she gives him up, could certainly be a possibility... I just don't have the connections or connections to connections for networking I used to have to find these guys homes. Truthfully, if he's not a head-case, he really would be more than welcome here. It just would be so much easier on us if that day came after Boomer and/or Dempsey had their final sleeps. I feel awful saying that but, given their ages, it's just being practical - not that I want those days to hurry up and get here at all. I am in love with dragons little pic-spam fic for me. It was too perfect, right down to the detail of the "Beware of Dog" sign in the pic of them approaching the house. Too, too funny. I'm glad that you had a great bday! First of all - happy birthday!!!!! Second there - i wish you (all of you) luck - with settling Dacota and with everything. I hope you'll find a way to make all good for everyone (you included). And of course - yay! for your muse! Keep it up! Thanks, hon. I'll definitely post a Dakota update when I get a better feel of the situation. \o/ I just hope I can corral her for at least a couple more stories after this one is finished and uploaded. It's so nice of you :) I'm horrible with names but i remember the stories so even if i forget how his name is i will remember his story *sigh* Poor puppy. At least he still has home with you... and maybe you're right about keeping him here. Too much stress never does good to anyone. As to your muse - pester her with care and please and i'm sure she'll be kind to you (to us but it's a secret). But I certainly don't envy you that task over Dakota.. **hugs** What a bummer, best of luck. I am so with you there. Here's hoping I can hang onto her for more than just this one fic ;). I'm with you there too ::sigh::. At this point I'm just going to consider it an opportunity to assess him and get a real handle on his temperament, i.e. apparently he dislikes men now (not an issue when he was last here as an adult) and hubby is, without meaning to be, a pretty intimidating guy (usually "soft" dogs just crumble in his presence, hence in part why we've got terriers), so it'll be interesting to see how Dakota does around him. \o/ I got the "good to go" from e313 on the fic, and i'll try first emailing it to you (and then posting) before this thursday cuz i have this illogical fear that SOMEHOW i'll get jossed and i really need to get it to you (and out there) before the new episode arrives! HOMG. ps Consider this a teaser. *nod* What? If Kripke can do it, so will i! BWAHAHAHAHA! PS OF PS YEI HEAVENLY FATHERS! YEI KITTIES AND BIRTHDAYS! *g* You'll have to let me know what you think of my Castiel, how he sounds to your most attentive ears ;). And isn't Little Lora just the cutest kitten? She reminds so very much of my sister's senior cat, I'm amazed their evening considering giving her up but, with their future downsizing circumstances, etc., I see where they're coming from. I had a great birthday. Didn't hear from hubby - of course. I adore the man but he has never had a concept od days or the week or dates ::head shake:: Add to that having little brother along for the ride (who undoubtedly would in Sammy-like fashion have remembered for hubster if hubs would've said, "hey, remind me on the 2nd to call the Mrs." but, no, foresight is not something my man has in abundance ;). You know what would totally win me over? If Castiel is covered with Nutella at some point. *hides under desk* DON'T JUDGE ME. And yeeei on birthday! and superdays! and all the other awesomeness! Given my tortoise pace, you are a speed demon. Especially if you took time for research too! Happy Birthday :) Sorry it comes a day late. I hope your travels are going well.